Allie Wilson is 20 years old and has worked for Signature HealthCARE of Coshocton for 2 years as a STNA, right of high school. 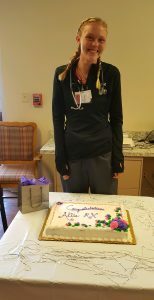 She passed her boards to work as a RN this past week. She will continuing to work with us as a RN while furthering her education to become a Nurse Practitioner. When asked what makes you want to work here, she said ” I love working with all of my coworkers”. Allie also has a 3 year old daughter, named Lillian, and is a newlywed to Tyler Wilson. She also loves to play with her dogs. We are thrilled to present Allie with a cake and a nursing bracelet celebrating her big accomplishment. Congratulations Allie Wilson!